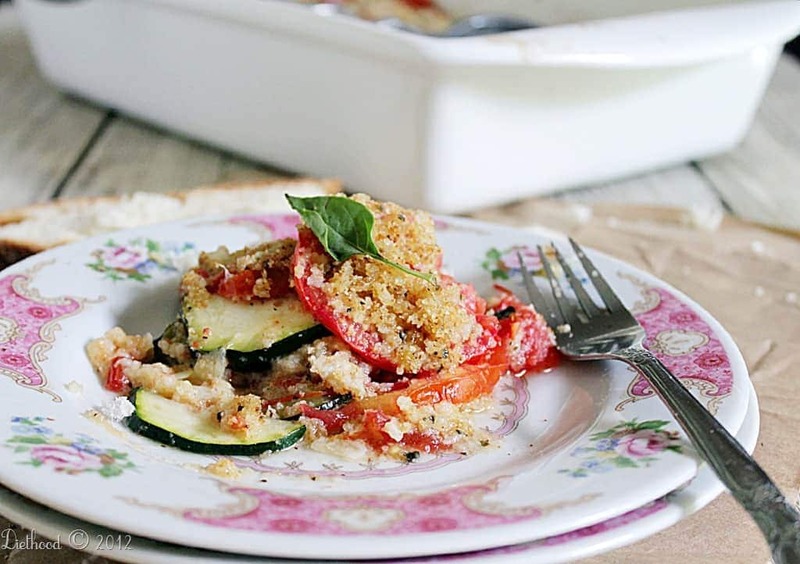 Zucchini Tomato Bake – Layers of baked Zucchini and Tomatoes, topped with a crumb mixture for a pleasing crunch. Do you have a garden? I have been gardening together with my parents for the past 5 years – my dad prepares the soil, my mom and I plant – and I can’t describe the amount of excitement and pride that I feel when I see results. 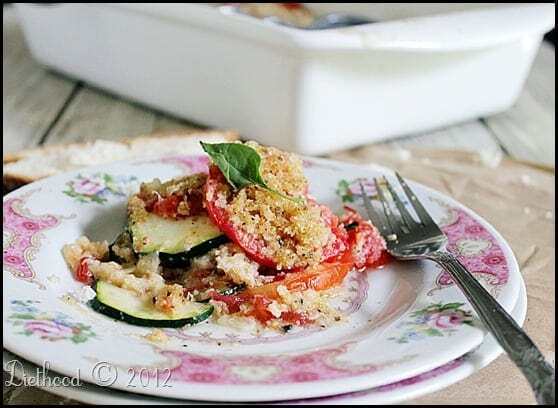 Take for instance this Zucchini Tomato Bake – the zucchinis and tomatoes in this dish all came from our vegetable garden. *On a side note: You know, I always forget to pick the zucchini on time, and when I do pick it, it is as long as my 3 year old. Honest. I can’t believe how big they can get over night. But, the tomatoes…ohhhh the tomatoes…wow! To say that they are delicious would be an understatement. Juicy, yet firm, sweet, yet tangy. The perfect balance. To add, you know you’ve got something good when you all run to the garden, pick a vegetable and eat it right there and then. No washing, cutting, plating. What’s better is when you prepare something with those vegetables and there are no leftovers. This dish was polished off in one sitting. That’s also very rewarding. But, I’ve come to realize that if I want this family to enjoy veggies more often, (summer is almost over and our garden is almost empty) I must pair those veggies with cheese. And crunchy bread. The first time I made this dish, I sprinkled the crumb mixture over every layer and across the top, thinking that it may add more crunch. Didn’t happen. I liked it, but the crumbs in between the layers were soggy. The next time I made it I put the entire breadcrumb mixture on top of the casserole and that was waaaay better. It’s up to you, though. You can try it both ways and see which one works better for you. You can also use different cheeses, but I recommend trying the Monterey Jack; it gives it a sharper kick. 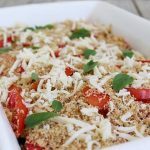 Zucchini Tomato Bake - Layers of baked Zucchini and Tomatoes, topped with a crumb mixture for a pleasing crunch. Arrange half of the zucchini slices in the casserole dish, lightly season with salt and pepper. 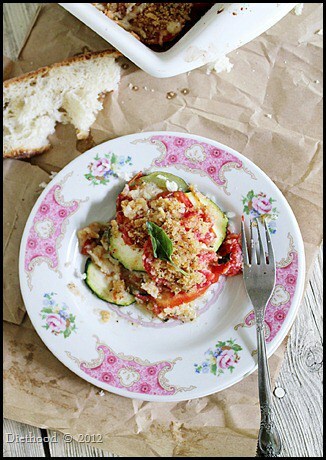 Arrange one-third of the tomato slices on top of the zucchini slices, lightly season with salt and pepper. Repeat layers, tomatoes should be the last layer. *Lightly season each layer with salt and pepper. In a large bowl, combine 1 1/2 cups of cheese, bread crumbs, garlic, and basil. Add the melted butter to the breadcrumbs mixture and mix well until incorporated. Sprinkle the entire mixture on top of the vegetables. Add the rest of the shredded Monterey Jack Cheese on top. Drizzle a bit of olive oil across the entire casserole, cover with foil and bake for 30 minutes. Remove foil and bake for an additional 15 to 20 minutes, or until the vegetables are tender. 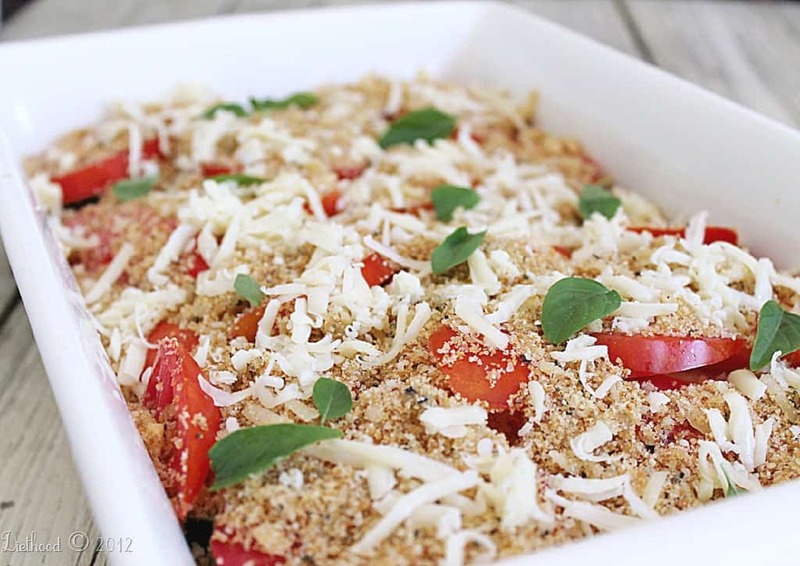 Sprinkle some fresh basil leaves on top and serve as a main course or a side dish to any meal. Totally loved it!!! I had a little goat cheese in the fridge, which I added and put Romano in with the crumbs. So quick and easy!! We all gobbled it up!!! I’m jealous of your family garden! It’s a wonderful way to teach children about food we eat too. I live next to the canyon where we have wild animals who eat our plants! So gardening is like a dream to me. It must be so nice to use your own veggies to make this delicious food. The flavor is simple, not over killing the ingredients that you can appreciate the natural flavor. Love this recipe! This is beautiful! Great seasonal dish and I just adore those plates. I should really invest in some pretty plates. They’re captivating. This sounds delicious Kate! 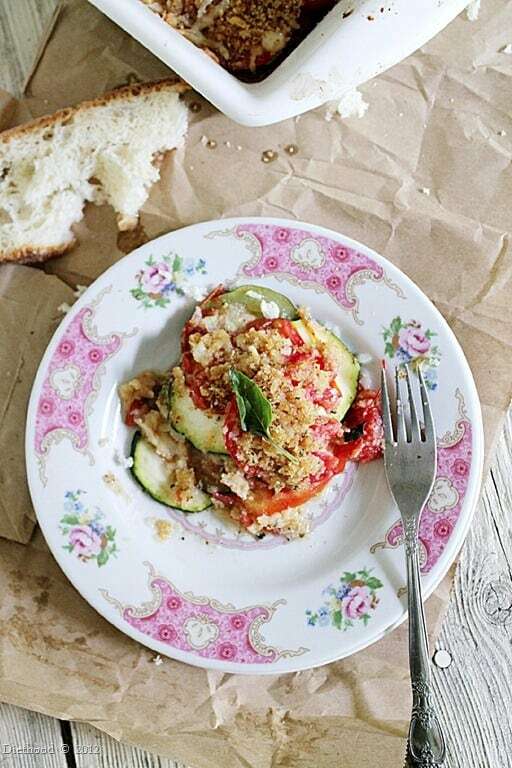 Tomatoes and zucchini are so wonderful this time of the year I try to eat as much as I can! Love the simplicity of this, my Mom used to make something similar and it was always a hit :)! Mmmm, perfect for the loads of tomatoes and squash I have coming out of the garden right now! Just popped it in the oven. Can’t wait!! I just love your pictures. They always make me so hungry! The plate is gorgeous too. And this dish is one that we would certainly enjoy. The bread crumbs were a great idea! What a perfect idea!! Looks sensational!